Legal technology is a $3 billion industry. Having established its roots in case and document management, it is increasingly infiltrating firm marketing departments. And that’s a good thing. Attorney at Work contributing editor Susan Kostal spoke with marketing technologist Scott Brinker, VP of Platform Ecosystem at HubSpot, about how technology is changing marketing and elevating its role in organizations. Brinker keynotes at the upcoming LMA Tech West conference. Q: Talk about technology’s influence in changing the role of today’s marketing professional. It’s fascinating. Marketing used to be, no offense to marketers, a fairly peripheral activity in most organizations. Generally speaking, the company made strategic decisions and then marketing communicated those. What has shifted, and has accelerated in the last few years, are all these digital channels: website, email subscriber list, social media. Marketing has taken the lead on all these digital touchpoints. These channels are much more than communications vehicles. They’re how customers engage with us and reach out to us. Marketing has taken on more and more responsibility to make sure people have a good customer experience when they come through these digital channels. Are we engaging them in the way they want to be engaged? This has put marketing more at the center of the organization. Q: What is the main advantage that tech brings to the table? These touchpoints give us so much data about prospect and customer activities. 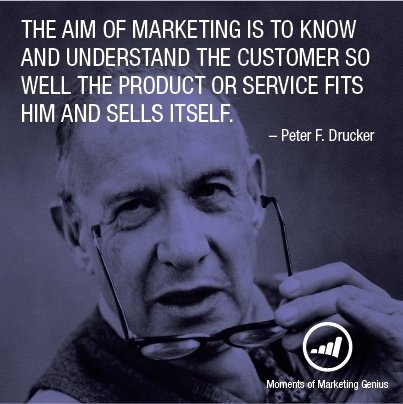 As we get those insights, marketing is coming back to its Peter Drucker roots, to speak with the voice of the customer. Marketing really gets to be at the table of customer strategy now. In the buyer’s journey, where is the momentum, where they are slowing down? We are seeing a tipping point in a lot of organizations. Marketing is increasingly the tip of the spear in how we think of our strategy and engagement with our target audience. Q: Who’s doing it really well? Tech companies have been pioneers in this space because it came naturally to them. They have pushed the rest of us to have better digital experiences and really embrace the digital customer-experience mission. Outside of tech, it is a long-tail distribution, meaning that there’s a wide range of companies having varying degrees of success. There are leaders in every industry. Q: What about progress in professional services firms? Some are pushing boundaries, but the majority are still adapting, still learning the right way to approach it. The advantage for latecomers in this space is that the best practices are pretty well-established. Additionally, while there is a lot of new marketing technology out there, there is strong competition among established products, so there is some price pressure. This means small firms have feature-rich, stable, affordable choices. The market has de-risked a lot of what you need to get started with a basic digital marketing platform — content management systems, CRM and the like. Q: You said it’s the data these tools provide that elevated the role marketing can play in companies. How does that benefit the late majority? The data models around proving what works are getting well-established, too. You should be tracking the pipeline — prospects and customers — from the first contact. We can map which people are coming into that pipeline and the rate at which they accelerate from prospect to customer. There isn’t perfect attribution in this world, but you can get some fairly decent attribution as to what gets you more clients and a higher close rate. When we continue to engage with prospects in this fashion, it increases the lifetime value of those client relationships. Q: You seem pretty passionate. I am passionate, but for the late majority, passion isn’t the way to sell marketing technology within your organization. It is the financial argument: “We need to do this, this is how we grow our business, and we can prove it.” For law firms to grow they need to advance from the top to the bottom of the funnel, and digital channels make it easier to manage that end-to-end journey. Firms can reach more contacts, and advance them to prospective clients, to actual clients, to repeat clients. Meeting customer expectations of the digital experience is a challenge for all industries, but especially professional services firms. We are so used to benchmarking ourselves against competitors, but things are changing so much, so quickly, your competitors are likely far behind. You do not want to benchmark yourselves against them but against the best service providers. What are they doing to create better and stronger relationships with their customers and clients? Those are the organizations to follow. In addition to his VP role at HubSpot, Scott Brinker is editor of the Chief Marketing Technologist Blog and author of “Hacking Marketing: Agile Practices to Make Marketing Smarter, Faster, and More Innovative.” He will deliver the keynote at 2018 LMA Tech West, coming up Jan. 31-Feb. 1 in San Francisco. Find more information about the #LMATech conference and registration here.